Officers have been assigned schools, where they interact with students, teachers and parents. Sheriff’s Capt. Dennis Picard spoke Wednesday night with school administrators, teachers and parents at a parent-teacher organization meeting in Albion, explaining the importance of police establishing relationships — and communication — with students. Picard, who has developed a School Resource Deputy Program for rural schools in Kennebec County, wants to change the way people view the presence of police at local schools, particularly in the wake of high-profile school shootings. • Provides law enforcement and police services to the school, school grounds and areas adjacent to the school. • Works to prevent juvenile delinquency through close contact and positive relationships with students. • Establishes and maintain a close partnership with school administrators in order to provide for a safe school environment. • Is visible within the school community. Attend and participate in school and after school functions. • Develops and implement classes in law related education to support the educational efforts of the school. • Initiates interaction with students in the classroom and general areas of the school building. 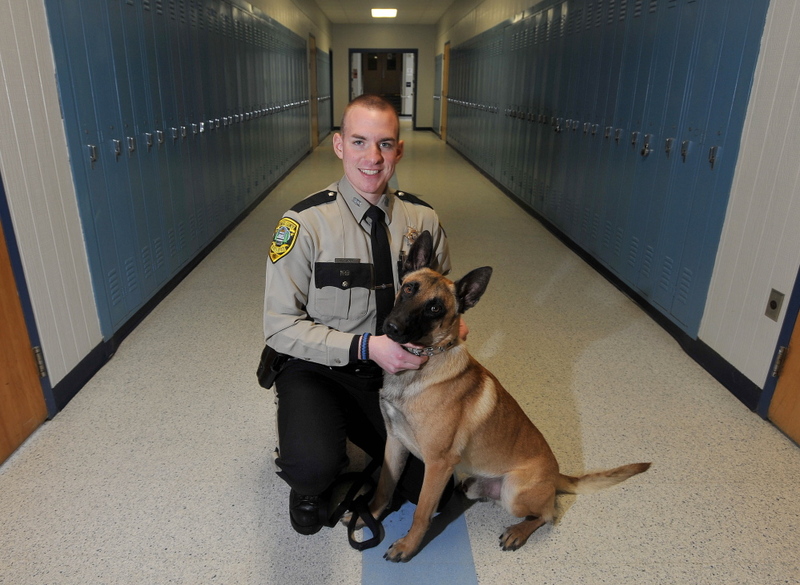 Staff photo by Michael G. Seamans Aaron Moody, a deputy with the Kennebec County Sheriff's office and his partner Striker, at Lawrence High School in Fairfield on Friday. Deputy Moody is the district's school resource officer. The program has been incorporated into deputies’ regular duties and is being offered at no cost to the rural schools. The time officers spend in schools varies according to schedules. Picard said the sheriff’s deputies have embraced the program. Many larger school districts, including Waterville and Winslow, have dedicated school resource officers from their local police departments. And at a time of tight budgets, most rural communities don’t have their own police departments and don’t have a dedicated school resource officer. Picard developed the program at the behest of Kennebec County Sheriff Randall Liberty, who challenged the patrol division to devise a way to spend more time in schools and make school safety a priority. In October, Picard initiated the effort. “We developed it, took ideas from the deputies and we kicked it off the first week of February,” Picard said. Letters from Liberty and Picard were sent to the 25 rural schools the program covers and posters were hung in school lobbies announcing the project. School officials have praised the effort. Pia Holmes, principal of Manchester and Mount Vernon elementary schools, said she is delighted with the new program because the deputies are getting to know students and staff, learning the school layout, attending and taking part in school functions and teaching law-related classes. Above all, the increased law enforcement presence provides a greater sense of security at the elementary schools, Holmes said. The deputies involved in the program are local residents and have strong ties to their communities and schools, according to Liberty. Every deputy in the county volunteered to adopt at least one school to mentor students and improve school security, he said. Sheriff’s officials from all levels — deputies, detectives, sergeants, and even Liberty — are working in schools as part of the program. Liberty said that schools and law enforcement agencies must be creative in protecting schools at a time when financial resources are limited. Deputy Jeremy Day is responsible for several schools, including Clinton Elementary, Vassalboro Community School and Belgrade Central School, as part of the program. While he has worked with schools for nearly two years, the new program establishes a more formal and uniform effort, he said. “It helps to establish a good relationship with the community, not just with students and teachers, but also with parents,” Day said. Day works with teachers to practice lockdowns, interacts with students in a positive way and has discussions about drug awareness, bullying and appropriate and inappropriate behavior, among other things. He encourages parents to approach him with any questions they have. Sgt. Emily Childs works in Manchester and Windsor elementary schools, talking with children, working with teachers and guidance counselors and serving as another role model for students. She also reads to kindergarten students during library time. Having an extra person in the room who is not in the schools full time encourages the students to show off their reading skills or talk about their favorite subjects, she said. She said it’s important for children to interact with law enforcement officials in a non-emergency environment. The world is changing and law enforcement must work with schools to adapt, according to Childs. “We have to prepare for the worst and hope for the best, at all times,” she said. Holmes, the Manchester principal, said Childs has a wonderful way with children and already has engendered the respect of staff and students. The new program, she said, is a boost to schools. “I think we have challenging times and I think their (deputies’) knowledge and our perspective work well together,” she said. The support the program offers is huge, according to Holmes.